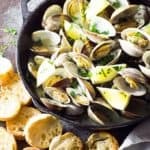 Just 15 minutes is all you need for these steamed clams in a velvety, buttery garlic wine sauce! In a large skillet (that has a lid), melt 2-1/2 tablespoons of the butter over medium heat. Add garlic and cook, stirring constantly, until fragrant (about 30 seconds). Add wine and lemon juice. Bring to a boil. Add clams and remaining butter. Cover and steam until clams have opened (about 7-8 minutes). Occasionally shake skillet while steaming. Discard any clams that do not open. Sprinkle evenly with parsley and garnish with lemon wedges, if desired. Serve with a french baguette or over a bed of cooked pasta.